Source: Precision Automation Co., Inc. This Package Leak Detection System is designed to test flexible packaging or pinhole-sized leaks ("slow leakers") which can lead to spoilage of processed foods in the warehouse, in shipment or on a grocery store shelf. Precision Automation Co., Inc.e Leak Detection System is designed to test flexible packaging or pinhole-sized leaks ("slow leakers") which can lead to spoilage of processed foods in the warehouse, in shipment or on a grocery store shelf. 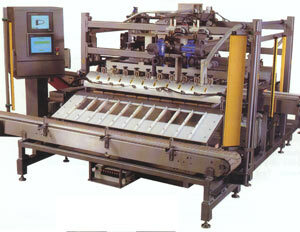 The system is a fully automated, on-line system and can be integrated into virtually any processed food product line. Every package is tested for leaks on the production line. System features include the ability to detect small leaks, gross leaks and excessive residual gas. Machine controls provide for manual or automatic operation, sensor calibration, graphic operator interface, data acquisition, and report generation. The test cycle consists of automatic loading of packages, closing and sealing the test chamber, vacuum application, test process monitoring, unloading from the test chamber and automatic rejection of leaky packages. , Box 18, Haddonfield, NJ 08033. Tel: 609-428-7400; Fax: 609-428-1270.